It is one of the largest species of day geckos. Their body color varies from brownish-grey to greenish-brown. 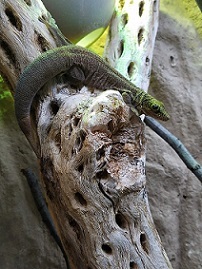 The Standing's day gecko is diurnal and arboreal. Their toes have special adaptations which allows them to adhere to a variety of surfaces. Conservation: Habitat fragmentation and destruction due to conversion to agricultural lands has had a detrimental effect on the free-ranging population numbers of this species. They are also overharvested for the pet-trade.